North Norfolk coastline stretches for 43 miles along the area of North Norfolk, England, and much of it is designated as an Area of Outstanding Natural Beauty. The diverse landscape includes wide sandy beaches, pine forests, salt marshes and mudflats and as the seasons change the countryside takes on very different qualities. The beaches in the region are known for being long and sandy, and many have been the location of music videos and films. Please click on the links below to find the best holiday accommodation and attractions in the North Norfolk Coast area. Alternatively please click on the links on the right to explore some of the other towns and villages in Norfolk. North Norfolk forms part of the largest coastal nature reserve in England and Wales. Bitterns and terns, oyster catchers, avocets and marsh harriers are among the species which make North Norfolk a prime site for birdwatching. There are also many activities to take part in, for example Cycling, Boating and Seal Trips, and many attractions to see, like ancient historic sites, excellent bars and restaurants, and Bewilderwood, an excellent outdoor activities centre. The Wash House Luxury Cottage, Norfolk. Lovely self catering cottage in the heart of Blakeney in Norfolk. Sleeps 3. Renovated in a contempoary style with an open plan living dining area. Separate downstairs bathroom with bath and hand held shower. One well-behaved pet by prior arrangement. Please click the link for more information on our self catering cottage in Norfolk. We are always updating this page for North Norfolk Coast, in Norfolk. If you would like to contribute material or pictures to this, please email us. In the meantime, please just click on the links below for the full range of holiday accommodation, from high quality hotels near North Norfolk Coast, to nearby North Norfolk Coast B&Bs and guest houses. 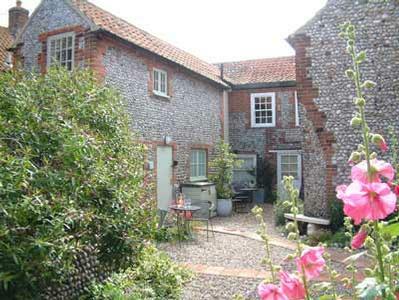 There are also a good range of self-catering cottages around North Norfolk Coast. There is a wide range of attractions, places to eat and other activities to suit all tastes in and around North Norfolk Coast. Lovetoescape.com aims to provide a one-stop shop for holiday makers by providing easy an easy to use directory and information portal for all types of holiday accommodation and attractions in the UK. If you would like to advertise your North Norfolk Coast attraction, Hotel, North Norfolk Coast cottage, or B&B in North Norfolk Coast, please take a look at our advertising options.